Italian theater and film actress Giovanna Mezzogiorno is the other female judge alongside Kate Beckinsale during Cannes Film Festival. Over the next 2 weeks she will exclusively wear Vionnet. At the judge photocall she wore Vionnet black silk jersey and midnight blue crêpe de chine dress, which was paired with gold trim black suede sandals. For the “Robin Hood” premiere she wore a custom-made rose pink crêpe de chine dress, which she paired with a studded clear plastic clutch. 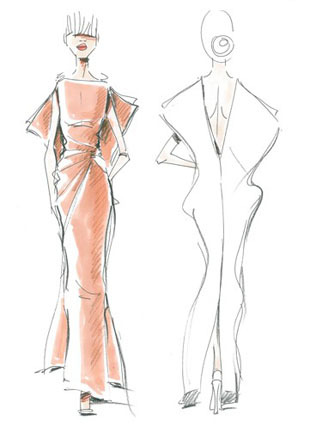 With the exclusion of Carey Mulligan’s custom BAFTA gown, Vionnet are not known for their gowns like Elie Saab for example, so it’ll be interesting to see how they dress Giovanna for the premiere’s.